- 50" inch tripod: lightweight and compact design. - 3 section aluminum alloy legs. - 3-way panhead with tilt motion. 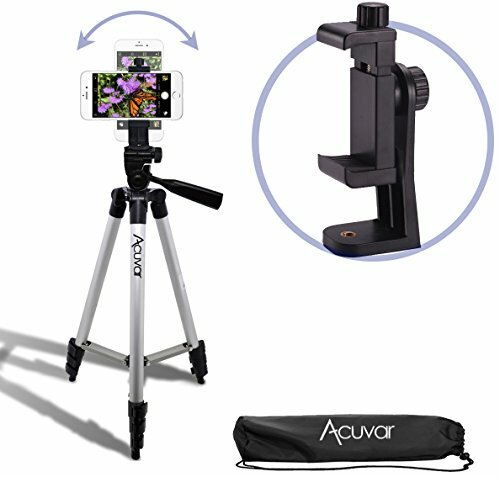 - Mount rotates 360° degrees for both landscape and portrait mode. - Rubber padding keeps your phone snug yet safe from scratches. - 2 mounting locations:unscrew the back to separate the 2 components. - Fits ALL smartphones: iPhone X, 8, 8+ 7, 7 Plus, 6, 6 Plus, 5s Samsung Galaxy, Note, Android phones. 50" inch tripod: lightweight and compact design. • 3 section aluminum alloy legs. • Bubble level indicator. 3-way panhead with tilt motion. • Mount rotates 360° degrees for both landscape and portrait mode. Rubber padding keeps your phone snug yet safe from scratches. • 2 mounting locations:unscrew the back to separate the 2 components. Fits ALL smartphones: iPhone X, 8, 8+ 7, 7 Plus, 6, 6 Plus, 5s Samsung Galaxy s8, s7, s6, Note 8, Note 7, Android phones. Closed Specifications: Width=2.2"(5.5cm). • Open Specifications: Width=4"(10.3cm). If you have any questions about this product by Acuvar, contact us by completing and submitting the form below. If you are looking for a specif part number, please include it with your message.